Using 4 forwards on the power play is generally a good strategy. Four forward units take more shots, score more often on those shots, and post a better goal differential than 3 forward groups do. It’s also a strategy that has become more popular over the last few years. 4 forward units have accounted for roughly 56% of the 5-on-4 ice-time this season, up 4% from last year and more than 15% from 5 years ago. What’s the deal with Andrew MacDonald: Why do the statistics suggest he’s terrible? Did you really think I was going to miss the opportunity to post the AMac with chains gif again? You thought wrong. Islander Defenseman Andrew MacDonald is one of the hot names being bounced around during the trade deadline. On one hand, this makes sense: He’s making basically nothing on his current contract, he’s one of the time on ice leaders in the NHL this year and has handled top level competition for a few years now. Yikes. That 2013-2014 number is downright terrible, dropping MacDonald into the bottom tier of defensemen. 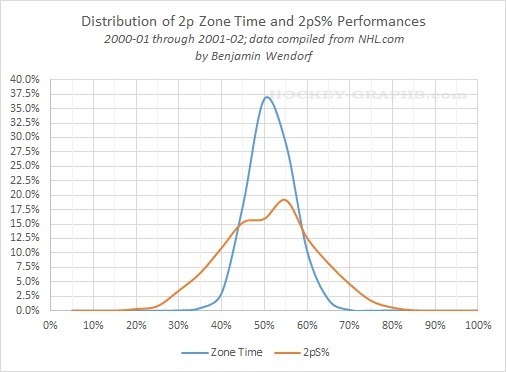 And no zone starts and certainly not competition (see this article for an analysis of AMac vs various levels of competition) does not account for this. If you believed the fancystats, AMac isn’t just not a top tier DMan, but not even a 2nd or 3rd pairing guy who could help any team at all. Yet teams seem to believe he’s worth a high pick? So what’s going on? Is the conventional thought completely wrong here?